Murray Family Farms is first and foremost a Cherry farm! We have the largest selection of cherries of any commercial grower in all of California, and we're the first place that cherries are harvested in the ENTIRE WORLD! ! We grow a huge variety of cherries on our farm. It not only lets us have a good selection of flavor profiles, but it also gives us the ability to constantly offer fresh picked produce, as each family of cherries has a slightly different harvest time. The Cherry on our logo is modeled after a real cherry! The Tulare Cherry has a habit of a strong arch and pointed crest giving it the look of an adorable little heart! We chose the heart shaped cherry for more than just the fact that they are absolutely adorable. It also has meaning for us! The three connected cherries symbolize the three most important things to us. Our staff, our Customers, and our Farm! They all make it possible for us to bring our produce and our love for farming to everyone in Kern County and around the world! The GG1 cherries are wildly famous among Family Farm Fanatics. They are HUGE, dark, and unbelievably delicious. They have a very low acid, which causes the sugar to stand out! GG1's may have a silly name because... well, they don't really have a name! You won't find these mega cherries anywhere else because they are from a cherry breeding farm. They come from Row G, Lane G, Tree 1. It's breeding designation was 441B18, but GG1 sounds so much better. The GG1 was originally brought to the farm to serve as a "Prolific Pollinator" meaning trees pollinated by the GG1 have an Supercharged production. It was a surprise when the cherries happened to be one of the most popular we grow! The Brooks Cherry is the Yin to the GG1's Yang. Where as the GG1 is Sugartown, this variety has well balanced acid and sugar, giving it a rich and full flavor. The acidity in the Brooks also preserves it's crispness, making it a crunchy treat! Mrs.Murray's favorite cherries are the Brooks! They're one of the first cherries we ever grew! The Regal and Royal Rainier! One of the most delicious varieties we grow, rather, one of the most delicious in all of cherrydom is the Rainier Cherry. What makes the rainier such a thunderously delicious cherry? Well, as we learned with Brooks and GG1, Acidity and Sugar have a close relationship! The Rainier has little to no acid, giving it a honey-sweet flavor as opposed to the traditional sweet-tart of most cherries. Brix are the scientific measurement of sugar inside a fruit, where One degree Brix is 1% Sugar. Our Rainier regularly come in at 20 and sometimes as high as 25 Brix! That means that 25% of the cherry is all sugar! Rainier cherries come from a Red Cherry and a Black Cherry! It was developed in 1952 at Washington State University by Harold Fogle, and named after Mount Rainier in Washington. It is a cross between Bing and Van cherries. The Bing is dark as can be, yet the Van is red! You may be wondering why these red and black cherries gave birth to a beautiful cherry with peachy hues of yellow, gold, pink and red like a symphony of color straight out of mother nature?! The truth is, we're not really sure. But we're going to find out! Prepare yourself though, this is going to be some pretty deep science. Definitely Family Farm Fanatic or Fruit Nerd stuff! Don't forget the little ones! MiniRoyal and Sweetheart variety of cherries tend to be rather small but with a distinct flavor that recalls hints of Cranberry or Rhubarb. The MiniRoyal in particular has a light pink flesh that makes them just that bit extra when it comes to presentation, while the Sweetheart has the same traits but greater sugar! And even more varieties than that! You can try them all at our Cherry Festival, where we bring every available variety for a gourmet cherry bar, with tons of games and celebrate everything that has to do with Cherry! We hope to see you at the #BRB! Check out CherryFest by clicking here! We can't finish a Fruit Spotlight without showing some love to our Family Farm Fanatics! We know you guys love that little bit of extra, so here it is. The Cherry on top, all the weird and awesome cherry facts you could ever need. Not every Cherry is sweet. There are also "Pie cherries" that are grown specifically to be used in pie, and have a rather profound kick to them. 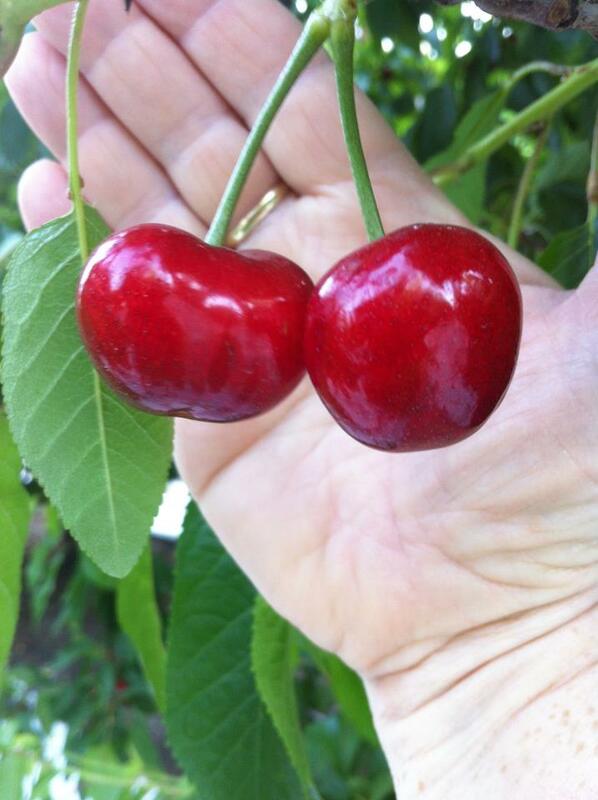 We do grow pie cherries, but they are very limited due to their popularity! You have to call ahead to the Big Red Barn if you want to get your hands on any. Bing Cherries aren't named after Bing Crosby! They're named for an orchard foreman named Ah Bing, who together with cherry farmer Seth Lewelling developed the Black Cherry in Milwaukee, Oregon. The story goes that Lewelling named the cherries in Bing’s honor after the foreman returned to China and was forbidden from returning under the Chinese Exclusion Act of 1882. Jindaizakura in Hokuto City, Yamanashi Prefecture is believed to be one of Japan's oldest cherry trees at 2,000 years old. 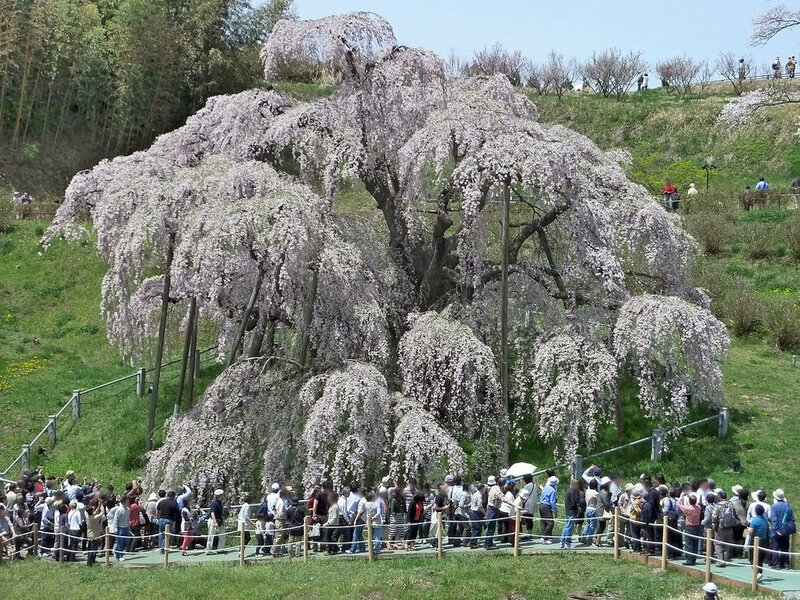 The ancient cherry tree is said to have been planted by Prince Yamato Takeru (an ancient hero of Japan). The name Jindaizakura means “divine generations cherry blossom” in Japanese. I really suggest you click on the image to see it in full. It's absolutely too gorgeous! Cherries are REALLY good at treating gout. Dr.Greger has a very cool Youtube channel where he talks about various interesting health studies, but this one was especially special! Not only were cherries good at preventing gout flares, but they also made treatments more effective! Woah! You probably see videos like this all the time, but for really reals, this is good stuff. Give it a peek! Cherries have a very short season, so when something is referred to as being "Cherry" it implies that it's new! You won't ever find an old cherry! Unless it's dried, that is! There are over 1000 varieties of cherries out there! From Lamberts to Lapins to Rainers and Royal Anns, there are more than 500 varieties of sweet cherries, and almost as many tart ones. But only a small percentage—around 20 or so altogether—are used in commercial production. We're going to change that! Specialty produce has been an awesome place to get Murray Family Farms produce for a long time, so we thought it was super cool that they did a whole podcast on the history of produce! Check it out! Ok, This isn't quite a fun fact, but it is just beautiful!